Our keepers will be doing a daily talk throughout August at 2:00pm near the Rhino Paddock about these magnificent animals, the threats and the conservation work that is going on to try and protect them for future generations. We are giving away three Rhino Adoptions during August. Download and colour in our Rhino Colouring Sheet for kids aged 1-5 years. Click here to download the Rhino Colouring Sheet. Design an A4 size poster that highlights the plight of Rhinos, conservation message or fact about Rhinos (5-11 years and 12-16 years categories). 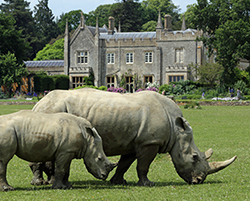 Rhino Adoption Competition, Cotswold Wildlife Park & Gardens, Burford, Oxfordshire, OX18 4JP. Closing date is 31st August 2018. Winners will be announced in early September. Please write your contact details plus the name and age of the child on the back of the entry. Please let us know if you give permission for your child’s first name and age (only) to feature on our social media/website alongside their poster/colouring entry. One entry per child.